Below Seongheungsanseong Fortress (built in 501 during the Baekje Kingdom) in Buyeo is an ancient temple called Daejosa (great bird temple). Inside the temple grounds stands a giant standing stone Buddha statue looking toward the east. 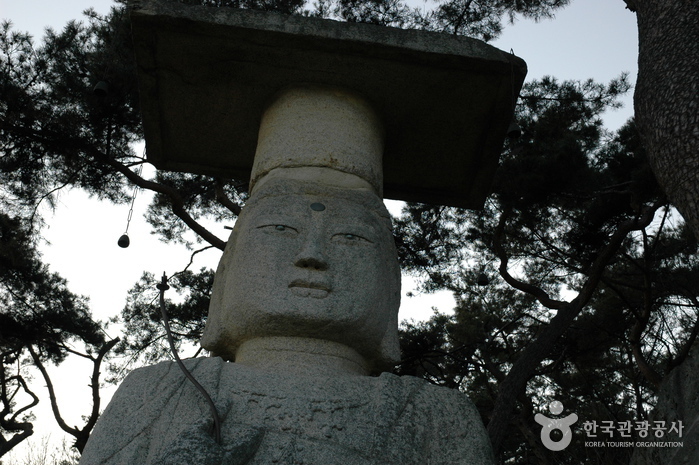 The temple, which was founded during the 5th year of the Baekje Kingdom, has an interesting legend behind its origin. According to the legend, an old monk fell asleep after praying under a large rock on the slopes of Seongheungsan Mountain. In his dream, a large bird with a golden glow flew in from the west and sat on the rock where Daejosa currently stands. While the bird continuoulsy flapped its wings, a ray of light shone on the rock and it was there that the statue of Avalokitasvara Bodhisattva appeared. The old monk had the same dream at the same time for many days. He recounted his dream to the seongju (castle lord), who then reported it to King Seong of Baekje. The king interpreted the dream as a sign that it was the right time to move the capital of Baekje to Sabi (now Buyeo) and ordered the construction of a large temple at the location that appeared in the dream. The temple was so big that even at a hurried pace, it would still took 10 years to build. Workers had to work day and night and every time the workers felt tired, birds would come singing to brighten up the atmosphere so that the workers can forget the fatigue and continue working. Hence, the temple was completed after only five years. Because of the golden bird, the temple was named Daejosa, literally meaning ‘great bird temple. The rock on which Avalokitasvara Bodhisattva appeared in the dream was turned into a stone statue of a Buddha. This standing stone Maitreya Bodhisattva statue is a fine work of sculpture which, along with the stone Bodhisattva of Gwanchoksa Temple (Treasure No.218), is representative of the early Gorye period. In front of Wontongbojeon Hall (a hall enshrining Avalokitasvara Bodhisattva) stands a pagoda. In the old days, the stone pagoda used to have only the cover stones but as the pagoda body stones were found, the pagoda structure was restored in 1975. 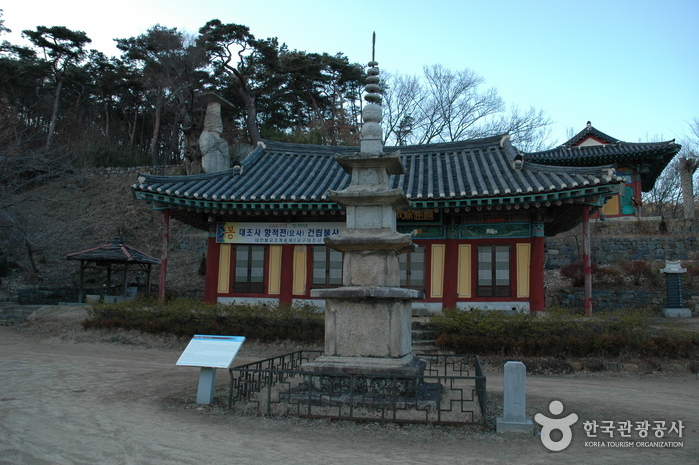 This pagoda is assumed to have been built in the early days of the Goryeo Kingdom.